Holzinger, A. & Jurisica, I. 2014. 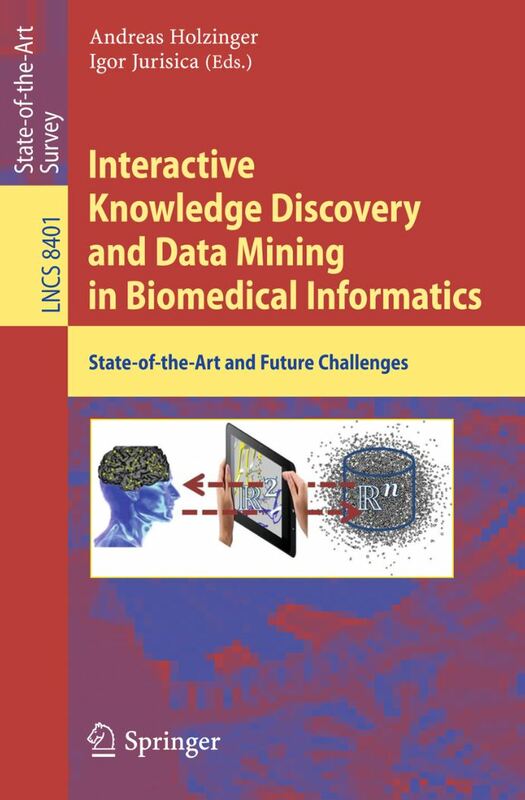 Interactive Knowledge Discovery and Data Mining in Biomedical Informatics: State-of-the-Art and Future Challenges, Springer LNCS 8401, doi:10.1007/978-3-662-43968-5, [Springer Link], Contents in [DBLP], [Amazon]. One of the grand challenges in our digital world are the large, complex and often weakly structured data sets, and massive amounts of unstructured information. This “big data” challenge is most evident in biomedical informatics. A synergistic combination of methodologies and approaches of two fields offer ideal conditions towards unraveling these problems: Human–Computer Interaction (HCI) and Knowledge Discovery/Data Mining (KDD), with the goal of supporting human capabilities with machine learning. This state-of-the-art survey is an output of the HCI-KDD expert network and features 19 carefully selected and reviewed papers related to seven hot and promising research areas: Area 1: Data Integration, Data Pre-processing and Data Mapping; Area 2: Data Mining Algorithms; Area 3: Graph-based Data Mining; Area 4: Entropy-Based Data Mining; Area 5: Topological Data Mining; Area 6 Data Visualization and Area 7: Privacy, Data Protection, Safety and Security.